Big Creek Park is a great hidden gem on the Roswell/Alpharetta line that caters to mountain bikers of all levels. It's a great escape that creates the illusion of being in the country without having to travel too far out of the city or suburbia. This park is a particularly great place for novices to learn to ride, due to the abundance of expertly maintained trails. 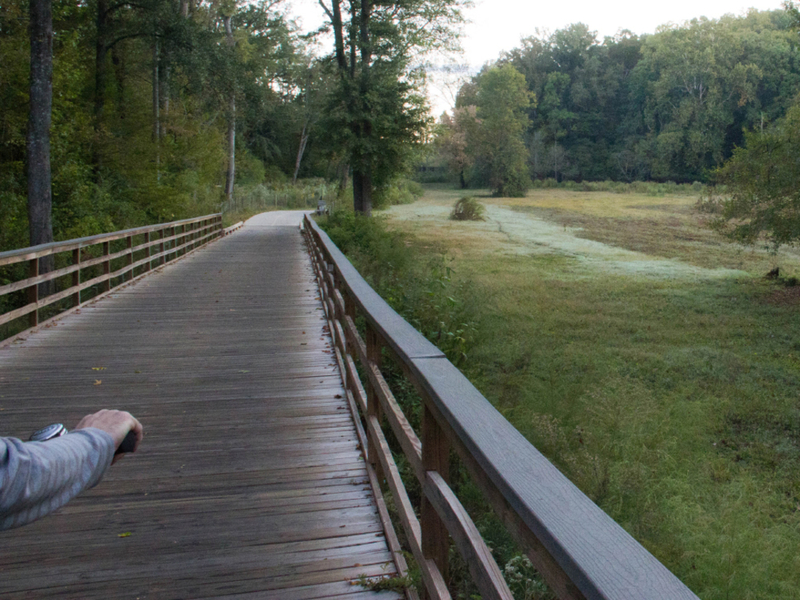 Big Creek Park is a great greenway, with tracks to offer cyclists of every level. There are many pockets of woods around the Metro Atlanta area in which to escape and explore, and this happens to have some great IMBA designed single-tracks. All the paths provide great scenery, and many wild animals and songbirds can be spotted along the way. This greenway is an awesome place to ride before or after work without having to travel very far; there are even routes short enough to fit in a good ride during your lunch break if you work in the Alpharetta area. There are 11 different trails to choose from, and note that it is a multi-use recreational area, so you are sure to encounter walkers and runners on a few of the multi-use trails. Be advised that unlike most bike parks, pedestrians have the right of way at all times on the multi-use trails, so be prepared to yield. Upon your first visit to Big Creek Park, you’ll probably expect to see a big creek, but the name is misleading. The trails are nestled in a long-dried up creek bed, and the area is aptly named for Big Creek, which used to flow through the area. You will pass by a few smaller creeks and a swamp along the way, depending on which trails you decide to take. All trails are day directional (except Troll Trail and the Greenway Connector) and direction is dictated by the day of the week, so be sure to check the signage before you begin your ride. Big Creek Park is truly a hidden gem for those in the know. Trails range in difficulty from beginner to advanced downhill, but the advanced sections are built and maintained so well that even intermediate riders are able to complete them; just be sure to exercise caution in these areas if you are not experienced. With angled bridges, log rides, dirt jumps and steep descents, you can make your ride as technical as you like. The park has a total of about 6 miles of biking trails, and all are well marked with both blazes and abundant signage. "Hurts So Good" and "Skillet Express" are two favorites. Riders of all levels can have a good time here. The drive from downtown Atlanta is a mere 20 minute trek, traffic permitting of course. The main parking lot is off Old Alabama Road, and there is another lot close to North Point Mall, near an abandoned furniture store; both provide bathrooms, vending machines and parking is free. Due to the obscurity of the parking lot near the mall, many people pass this area daily without ever knowing it’s there! All trails are closed to bikers for 24 hours after rain stops, both for safety reasons, and due to the fact that riding muddy trails erodes and destroys the surface and bench (where the trail is cut into the ground). Call the trail status hotline at 678-404-0814 for conditions/updates. During times of closure, you are still able to walk or run on the multi-use and running trails, so you may want to consider this as a good alternative for getting some exercise when cycling is not allowed. All trails close at dark. If you have any cycling questions, need a quick repair or some new gear, Fresh Bikes is located very close to this park. The trails are maintained by volunteers, and they are always looking for more, so check out RAMBO’s site if you’re interested to help keep Big Creek Park an awesome place to ride! Written by Alexa Lampasona for RootsRated.